IT was one of those “drop your bacon sandwich at the audacity” kind of stories – the sort of revelation that shows what power and influence in a democracy really means. Australia’s wealthiest individual, Hancock Prospecting chairman Gina Rinehart, loaded up a couple of Federal MPs onto her private jet and flew them to India for a wedding. What for? At the time, Rinehart was trying to secure a deal with infrastructure giant GVK, which had shown an interest in buying into some of her coal mine projects. Walking up the aisle was Mallika Reddy, grandaughter of GVK’s founder GV Krishna Reddy. As was reported in Crikey, the two MPs National Senator Barnaby Joyce and Liberal deputy leader Julie Bishop were there to “lend cachet” to Rinehart. Actually, it wasn’t just two MPs. Unreported at the time, but buried away in the register of interests, was an alteration to Brisbane Liberal MP Teresa Gambaro‘s entry. The change, recorded on 7 July, shows that Gambaro was also on the flight from Perth to India and stayed two nights in Hyderabad. Running out of important things? WE tend not to worry about running out of stuff nowadays. Since the invention of shops, we’ve become increasingly accustomed – bank balance willing – to being able to pluck pretty much anything from a shelf or storeroom somewhere. Obviously, you don’t want to run out of particular types of stuff at times when you need them. Like bread and milk at breakfast time, deodorant on the morning you go for that big interview (especially if it’s at a deodorant company), petrol when you’re miles from a petrol station, coffee at times when you’re awake, toilet roll when you’ve just…. well, you get the idea. Even if there’s a gap on the shelf where your favourite brand of plastic-encased price-inflated tap water used to be, there’s usually another exorbitantly-priced bottle of water (also available from a tap) to choose from. But what if we started to run out of really important stuff? Fundamental stuff. And no, I don’t mean Tres Chic Dead Black Eyeliner #65 or Frog-embossed bog roll. I’m on about food, oil and water. And I’m not talking about a shortage at the corner shop or supermarket, but asking if there’s a risk that as a planet, our supplies might be in danger of running low soon. I looked at these resource crunch issues in a feature for G Magazine on the challenge Australia and the rest of the world faces to secure food, oil and water. As is always the case in questions about sustainability or environmental degradation, the answers are way more complex than the question. It’s not so much that we’ll run out of water, but rather there’ll be a lot less clean water for drinking and growing food. It’s not so much that we’ll run out of food, but that food supplies will be less reliable. And we won’t squeeze the last drop of oil from the planet, just the easy to reach and therefore cheap stuff. Of course, the issue underpinning a lot of this has much less to do with running out of stuff, and a lot more to do with our ability to see and act before the problems hit. This post originally appeared on ABC’s The Drum. To bastardise a line from the 35th US president John F. Kennedy, it’s time that Australian politicians asked not what their climate policies can do for the opinion polls, but what they can do for the planet. I’M no commuter cyclist, but then I don’t commute. On the rare occasion I do need to get in to my city of choice (Brisbane) I’ll generally take the train or the bus. 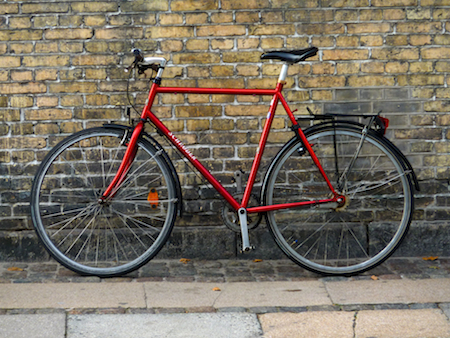 Taking the bike would mean about 12 kilometres along a disconnected network of paths through parks and along roads or a more direct 10 kilometre route along a main road choked with cars, buses and lorries. I prefer my legs and head unsmashed, although I do know people take this route daily and arrive unbroken. For every 100 journeys made in southeast Queensland each day, just a smidgen over one of them will be taken on a bike. Yet the Queensland Government wants to push this figure up to nine by the year 2031. Now assuming that oil prices don’t rise to the point where people are forced to reach for the handlebars out of necessity (which might happen), how will the Government and local councils get all of those bums out of air-conditioned over-sized steel boxes on traffic-clogged roads and onto rubber-clad cycling seats? Research by traffic planner Rachel Smith, who I spoke to recently for a story in BMAG, suggests one of the main reasons that more people don’t switch to bikes is because they don’t feel safe sharing the road with cars, scooters or motorbikes and their itinerant unpredictable riders and drivers. Funnily enough, painting a white line down a road and stencilling a picture of a bike on the asphalt doesn’t appear to give citizens much re-assurance that it will prevent them from being squished by something bigger and heavier than they are. Yet this appears to be the preferred method (the painting, not the squishing). At the moment we build skinny unprotected on-road cycle lanes, often less than half a metre wide and then stand back and wonder why ‘normal’ people don’t cycle. Smith returned from places like Bogota, Copenhagen and Malmo with a big idea. Cycling Super Highways – routes several metres wide , separate from traffic and all… well… super. But Smith is no lone nutty voice from some cycling utopia. Brisbane’s CBD Bicycle User Group want one linking northern suburbs to the city. Bicycle Queensland are lobbying for a handful of them too. And before everyone get’s their bike chains in a knot at the preposterousnous of actually giving up valuable city real estate to something other than a motor vehicle, it’s worth understanding a couple of things. The first is that there are cities around the world which have been bold enough and visionary enough to build things like this. The other is that, even now in Copenhagen, 18 local authorities are collaborating to build a network of commuter routes for bikes. As Dr Matthew Burke at Griffith University’s Urban Research Programme said to me, when it comes to getting people on bikes we need to take a philosophy from Kevin Costner (well.. who else?) in that film Field of Dreams. It’s a case of, if you build them… cycle routes… then they’ll come. Read a bit more about Rachel Smith’s big idea for bikes here. See her report here. FORMER jeweller John Hardy talks about the creation of his ingenious bamboo-built green school in Bali, complete with school buffalo, rice-growing lessons, compost toilets and the development of a whirlpool electricity generator. Plenty more sustainable fish in the sea? CAN I buy some fish please? BUYING fish is an extremely easy thing to do. All you have to do is ask. You can get it in a can, it comes battered or breaded in fish shops, filleted, whole or frozen on market stalls and every-which-way in supermarkets. Granted, there are questions that most consumers will ask themselves. Is it cheap, is it fresh and will it taste good, among the most popular. But all in all, there is no hunting or gathering involved for the consumer. Buying fish is not rocket science because the commercial fishing industry and retailers have made it so. But insert one word into your question and you have a whole new kettle of fish. Can I buy some sustainable fish please? Now that’s a question which is a gateway to a complex global issue because it prompts lots of other questions. Here’s a few of them. What kind of fish are you buying? This may be obvious, but in fact – in the case of tuna for example – even this can’t be answered with confidence. Is the species of fish you’re buying plentiful or are stocks dwindling or even endangered? Is the fishery which it came from being sustianably managed or overfished? How was the fish caught? Again your fish retailer, waiter or manufacturer is unlikely to be able to answer any or all of these questions clearly yet the impacts of commercial fishing and fishing methods are huge. ocean. The knock-on effects go unnoticed. Even if you choose to buy farmed fish, there are questions to be asked. 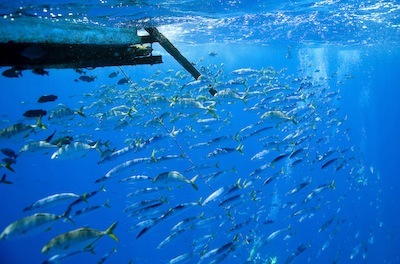 Is the fish farm out in the open ocean or connected to waterways? What impact is that farming operation having on the water and species living around it? The reason I’m asking all of these questions is because I’ve tried to address these, and a few more, in a special report in G Magazine.The report appeared in print last November but is now available free online. It’s long but hopefully enlightening. For a free guide to these issues, you can go to the Australian Marine Conservation Society’s online Sustainable Seafood Guide where you can buy a print version too. The image( credit Greenpeace/Paul Hilton) shows fish schooling under a FAD (fish aggregating device) in the Pacific ocean.I cover FADs in my feature, but Greenpeace has a good introductory video. Author GrahamPosted on February 15, 2011 February 17, 2011 Categories Conservation, Oceans, Sustainability1 Comment on Plenty more sustainable fish in the sea? Actually no, don’t bother. It would take too long. But as parts of Queensland hit the road to recovery, it is worth thinking about what makes a community resilient to extreme events like floods and cyclones. That’s especially important given climate scientists predict we’ll either be getting more events such as these or the ones we do get, will be more severe. There’s been much talk of how these events in themselves are bringing people closer together and this might be the case in the short term. The story as portrayed on the television news or in newspapers has been how people who don’t usually talk to each other (let alone help each other out) have been mucking in together. But relying on disasters to build cohesive communities would be an odd policy indeed. Once the working-bees are over and the media pack has moved on, will memories of sifting through sodden muddied possessions, repairing roofs or attending funerals be enough to keep people together? A few days after the floods had subsided, I went into the suburb of West End to see a community garden which, as you can see from the picture, had looked very different a week earlier. I heard about how volunteers from the suburb and from other parts of the city had streamed in to help repair vegetable beds, reconstruct worm farms and generally clean up the mess. New seeds and seedlings are already going in. In a story for bmag, social researchers tell me that community gardens aren’t just there to provide food. They act as social and community hubs that build friendships which are there before cyclones and floods, come together to recover from cyclones and floods and are still there afterwards. 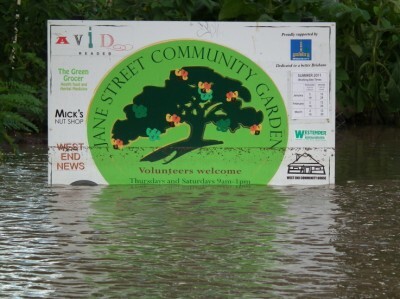 If you did want to go off and define resilience, maybe community gardens would provide a good case study. HERE’S a fabulous look at baseload energy while debunking some myths about wind power. You know the ones – it’s too noisy, they kill birds, they’re unreliable. The Clean Energy Council has also been on the front foot in putting a little context around claims wind turbines are excessively noisy. A link to their video here.